No, I neither smelled nor touched this liquid. But I can say with certainty that it was fresh, it filled all of the carved characters to the rim, and it hadn’t rained at all for two weeks. 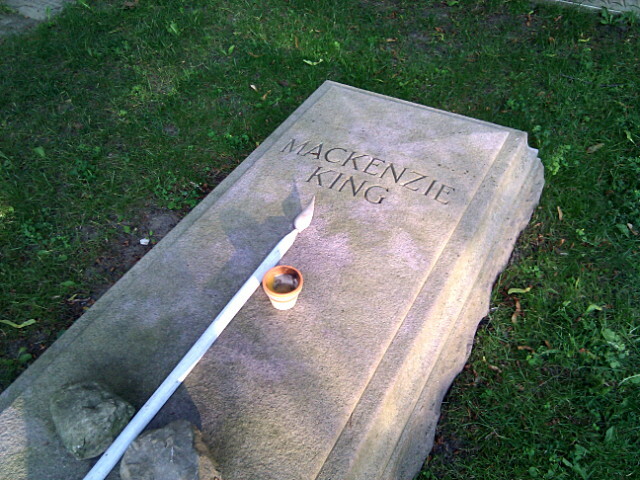 Between the pennies, the dowel, the rocks, and whatever this was, it seemed obvious that someone, perhaps many someones, had taken an interest in Mackenzie King’s grave. That, or his mother was trying to send him a message. It seemed to me that the accumulation of money could be explained by people seeing a few coins and thinking that it was a tradition to leave a penny. 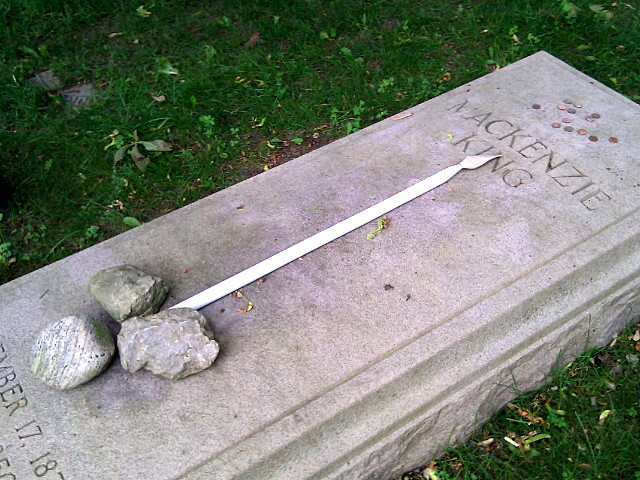 Sort of like tossing a penny into a wishing well, only not quite. 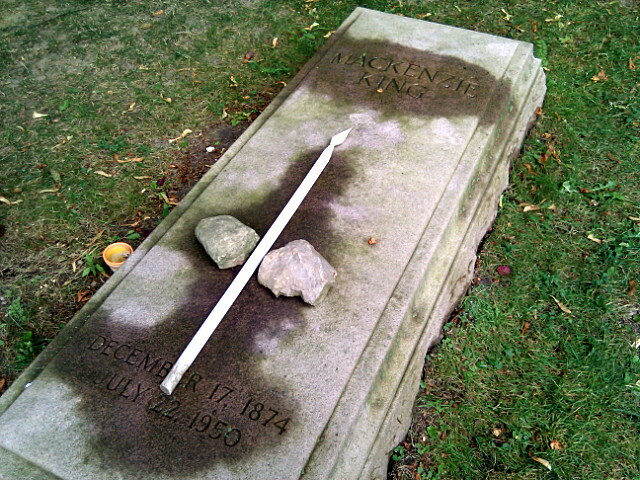 Less than two weeks later, three cents had disappeared, with the nickel being replaced by two cents and a trio of small stones. 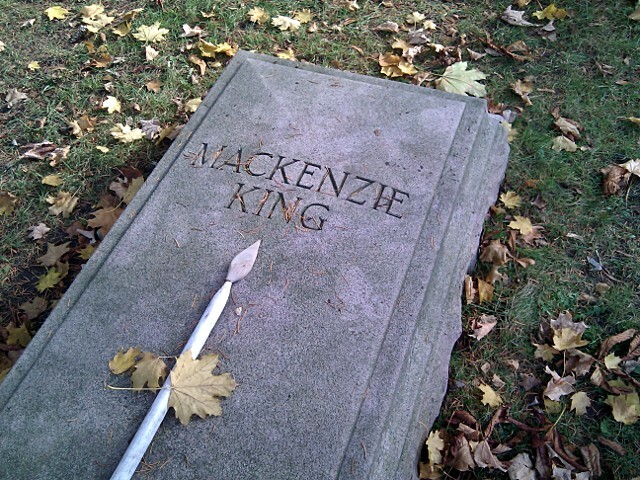 So what did I learn from five months of watching the evolving tributes on Mackenzie King’s grave? 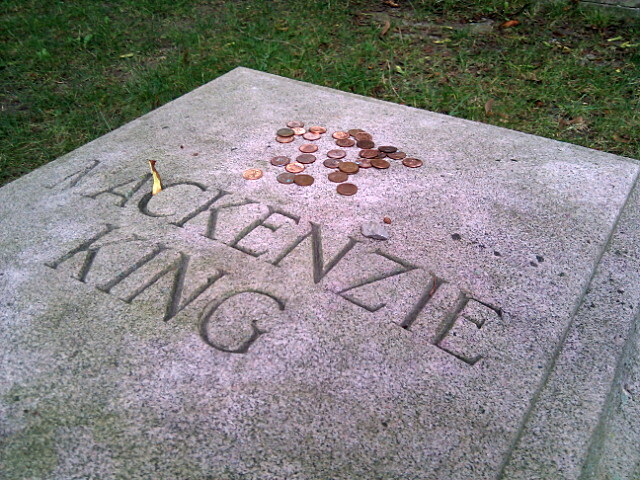 People will part with a penny if they think it’s part of a tradition. 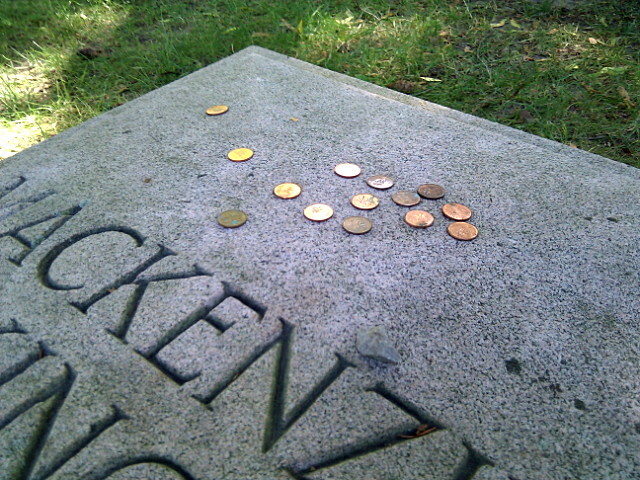 Seemingly many people will move objects (and cash) around on a grave, but few will take any of it. 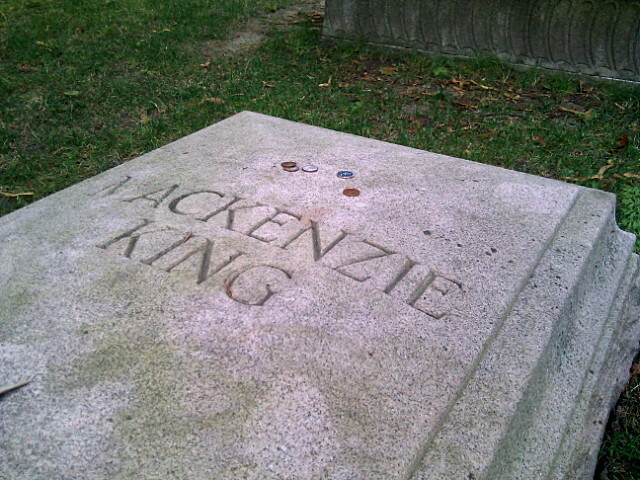 People will take a pile of coins that include nickels or dimes long before they take one that consists solely of pennies. 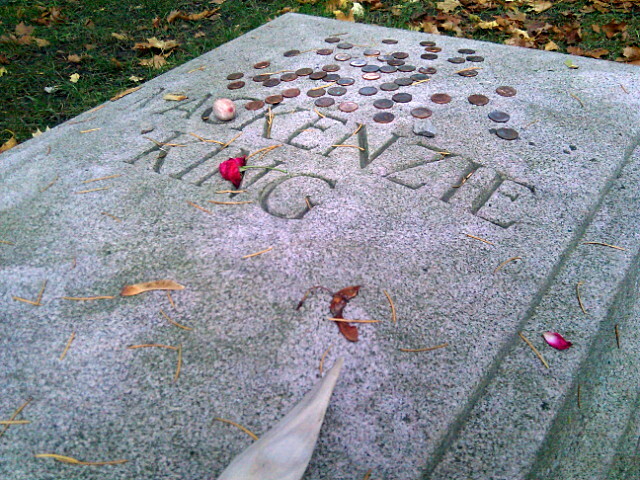 If you want to double your money in a month, drop some coin on a famous person’s grave and wait. Just be sure to retrieve the principle and interest before someone else does! I still have no idea where the dowel came from. While it was moved around on numerous occasions, it has been on or beside the ledger continuously since June. I’m not sure where the initial infusion of money came from either, nor about who was continuously rearranging it and the various objects on the ledger. 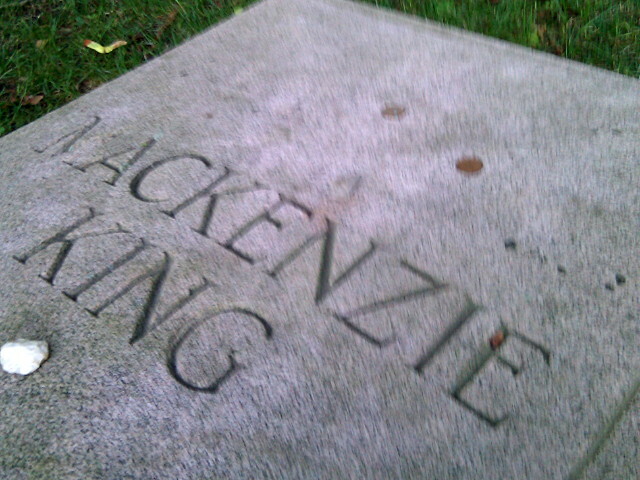 During the summer, I did see one person lurking around the grave who I would describe as suspicious, but I’m sure that I would have looked rather suspicious myself to a hidden observer. 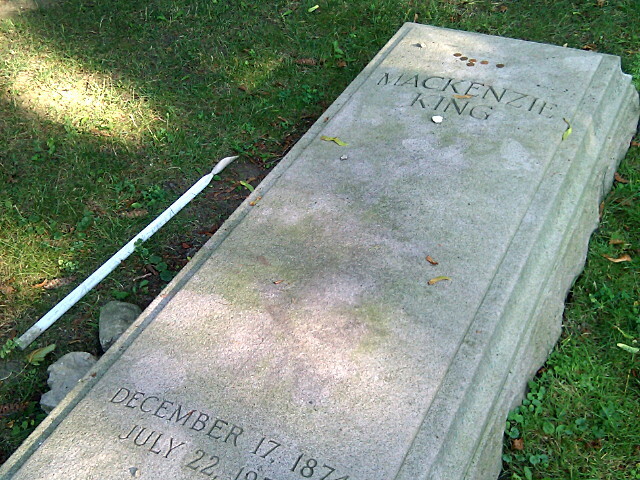 All told, Mackenzie King raised around $1.20 for someone’s popsicle fund this summer and fall. 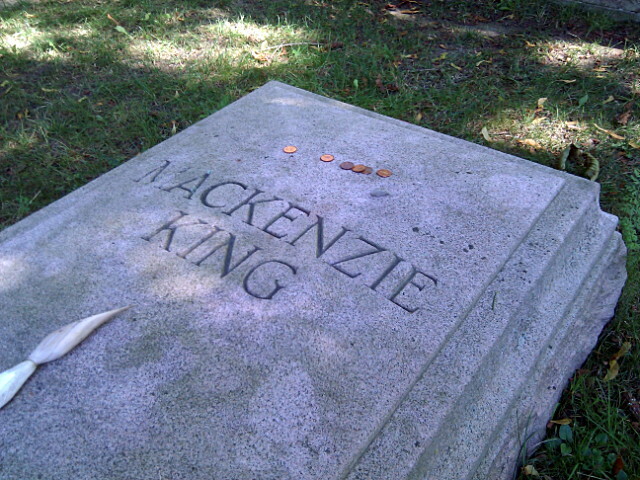 I keep asking everyone why the pennies are on his grave. It has consumed me. Love the story you wrote… it gives me some sort of closure. Thank you, Val, for this story and photos. 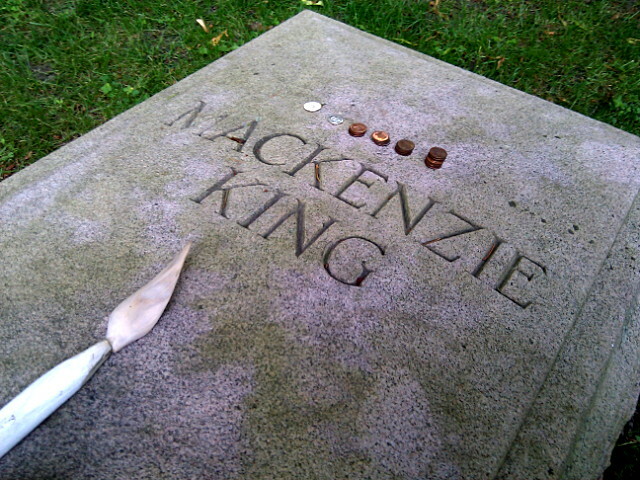 I was at the gravesite recently recently and found the monuments covered in coins, mostly pennies with the odd nickel. They looked like they had been there some time. 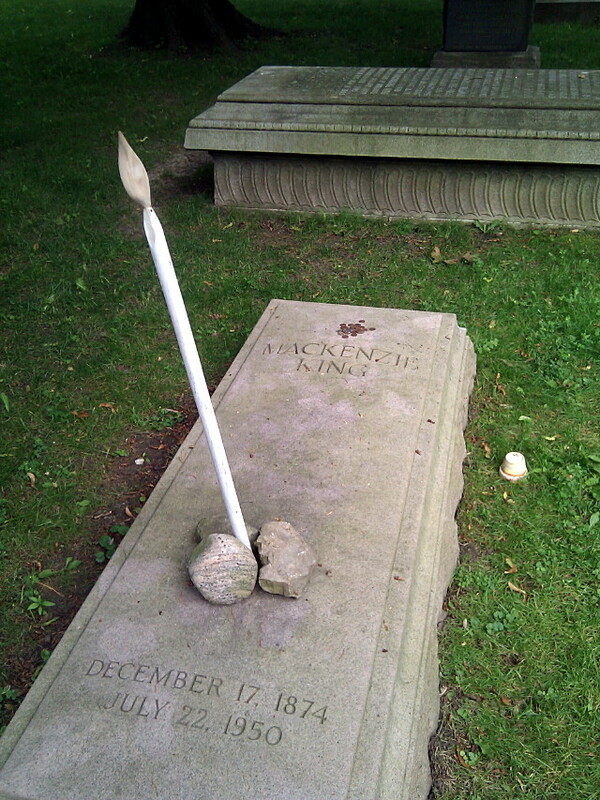 There on June 12 as part of my tour of all the historic sites of Ontario. I’m a writer. 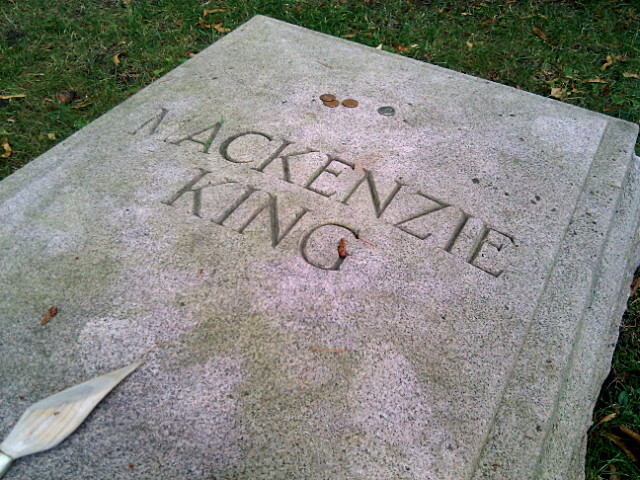 No dowel, a fair number of coins, but a Christmas wreath added amnd a polished stone that says Peace. Sooo cool; so weird.